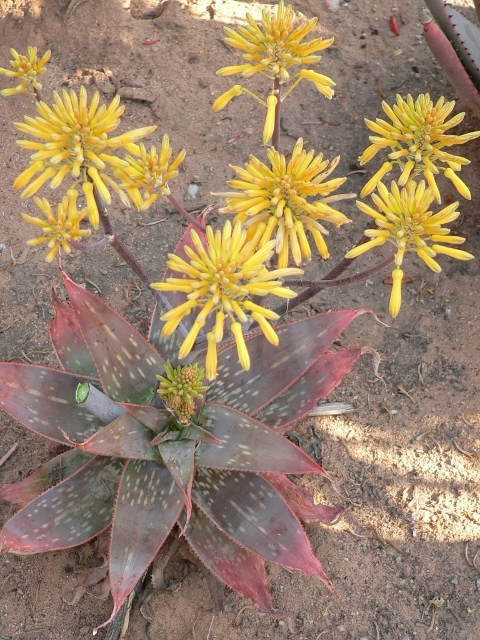 This medium to small aloe cultivar has created a following for itself even before its commercial release. This is because of its long-lasting yellow flowers in evidence throughout the colder months. 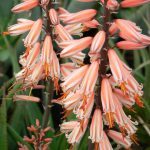 It has a really long flower season, thanks to its habit of producing consecutive inflorescences starting any time in autumn and normally concluding sometime in spring. The plant is stemless and will produce shoots from below ground level. 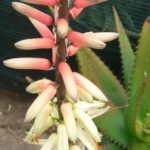 They can easily be removed, but provided they are kept clean of ants and aphids they can eventually contribute to a great flowering performance if they are kept on the plant. The green leaves are lined with small, pale spines, often from a pinkish base. Numerous irregularly spaced, elongated pale spots dot the surface of the leaves. This is a remarkably tough plant, capable of weathering extended dry periods when only the reddish colour of the plant reveals the stress it is under (see picture). Note that the main inflorescence has been removed, the flowers come from the second and there is a third inflorescence on its way. 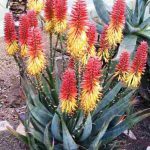 It can be grown successfully as an open rockery border or as a container subject, its small size making it easy to handle. Best recorded flowering display from a single rosette: 3 inflorescences with a total of 22 racemes. Inflorescences appear consecutively.